Hollywood Cemetery, located in the Oregon Hill neighborhood, ranks high on most Richmonders’ lists of places to show visitors. It was established in 1847 by private citizens who wanted a cemetery to rival Mount Auburn Cemetery in Cambridge, Mass. It was founded in 1849 as a “rural decorated cemetery” and as early as 1851, the cemetery had become a public park. It now contains more than 52,000 monuments and graves of many famous Americans. One of the best liked and well-known monuments is the cast-iron Newfoundland standing guard over a grave. Iron Dog is by far more famous as a curiosity than for the person buried there. In fact, there are many versions of the Iron Dog story, and the Valentine Richmond History Center helped to identify several. What is fairly certain is that a female toddler is buried there, last name Rees. I’ve seen at least three first names — Florence, Elizabeth and Bernadine, with the latter being the most likely. She apparently died of a childhood disease (maybe scarlet fever) in 1862 before she reached the age of 3. 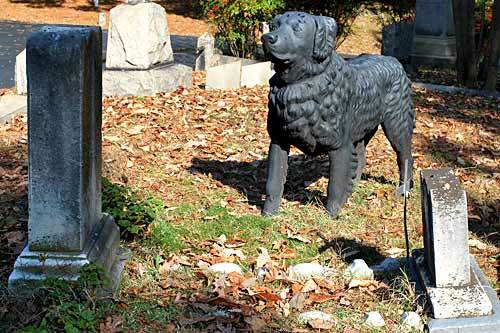 Iron Dog’s owner remembered how much the girl liked to pat the statue, so he gave it to her family to guard her grave. The girl’s family bought Iron Dog and placed it at the grave as a memorial to her. Some local historians think Rees’ father was simply preserving a family treasure in hard times. The Confederate government was confiscating cast iron from families during the Civil War. Even local churches — with the exception of First Baptist Church on Monument and Boulevard — gave up their church bells during the war years. Another twist that seems easy to debunk is that the Iron Dog came from Petersburg. That seems erroneous. A letter to the editor at the RTD (date unknown) says the dog belonged to Charles R. Rees who ran “photography gallery” in Richmond during the Civil War. Iron Dog was kept at the store and was moved by Rees to Hollywood Cemetery to keep it from being melted down for bullets. The letter was penned by a woman named Ada R. Bailey who claimed to be Rees’ granddaughter. 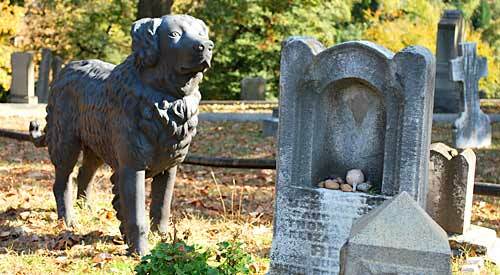 She said Rees moved to Petersburg in 1880 — several years after the dog was first placed in the cemetery — backing the theory that the dog was from a Richmond store. No matter which version you want to believe, the lore of the story is what people seem to love most. Trinkets, toys, coins and flowers are often said to be found at the grave and on the black Iron Dog, as if we all have some relation to the little girl and her famous guardian. finally got the bravery tto goo ahead and give you a shout out fdom Atascocita Texas! browsing tjis website dailly and get fastidious facts from here daily. Greetings! Very helpful advice within tjis post! This is my first time pay a quick visit att here and i amm actually pleassant to read everthing at siingle place. The undated newspaper article that you reference is from the Richmond Times Dispatch of May 16, 1949: Story of the Iron Dog in Hollywood Cemetery, by Ada R. Bailey. What a charming story! 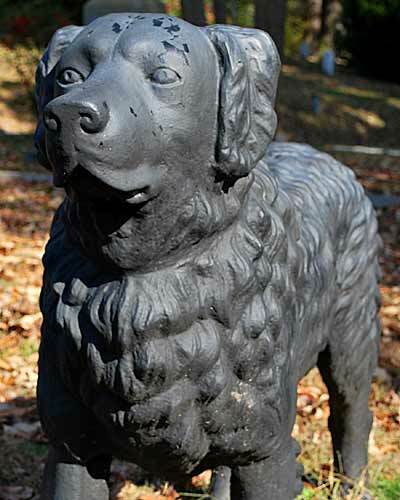 I love the story behind this amazing cast iron dog. well I think that the story is scary. Who wrote “The Ghosts of Richmond ?” I had gotten the book as well as the “Ghosts of Virginia” back in the early 90’s; but they’ve gotten lost between moves. I’d heard about the vampire that’s in one of the vaults near the entrance. It was written by L B Taylor. I grew up on Oregon Hill as well and visited Hollywood Cemetary several times. Recently, I visited it again and was amazed at the improvements and history that I wasn’t aware of as a child. I love going to the cemetary and hanging out by myself. I was wondering if you have heard any stories about The tomb of the vampire reads W.W. Pool. Mr. William Wortham Pool ? Very interesting story about the vampire list on this link. Thanks for mentioning this. I had never heard this story. There is a really wonderful story about this in “Ghosts of Richmond”. I had told my little granddaughter about it, and she wanted to see the dog. When we were in Va. this summer, we went to Hollywood Cemetery. I’ll have to look at the Ghosts of Richmond again — it has been too long. Thanks for the comment!